We have broken the guide down into sections for ease of navigation. If, at any stage, you need assistance, please email our Customer Service Team at trading@shareprices.com who will be pleased to help you or call us on 01892 700 843. More information about the service can be found in the How to use SharePrices Trading section of the website. Dealing online has never been easier as more and more customers discover how quick and simple it is to place an order and manage their portfolios. In order to access the online facilities, you will need to open an account, which can be done by clicking here. On the Home page there is button called "Log on to Deal" - click on this and you will be taken to the screen below. Type in the Username and Password you supplied when opening your account to gain access to the site. If you would like to change your password, go to the Account Administration section once you have signed in. Once you have successfully signed in you will be presented with the following screen. 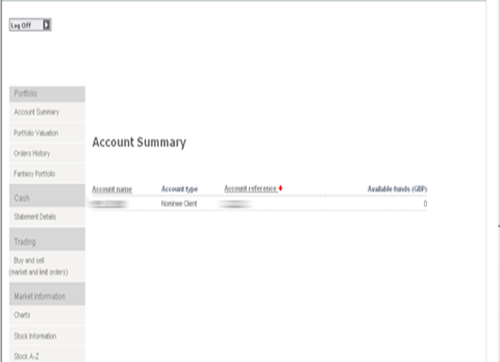 If you have a nominee account and an ISA, you will see both the account numbers listed below the 'Account reference' field in the centre if the screen. On the left hand side of the screen are a selection of navigation buttons, which you can use to look at your account statement details, access market and company information and review your portfolio and order history - you can even construct a fantasy portfolio. We suggest that you click into each section to familiarise yourself with the information that's available. Placing an order is very easy. On the left hand side of the screen, under Trading, you will see a light grey button labelled 'Buy and sell'. Click on the button and you be taken to the following screen. Using the drop down box, first select whether you want to buy or sell (you can only sell if you already hold the shares in your portfolio). 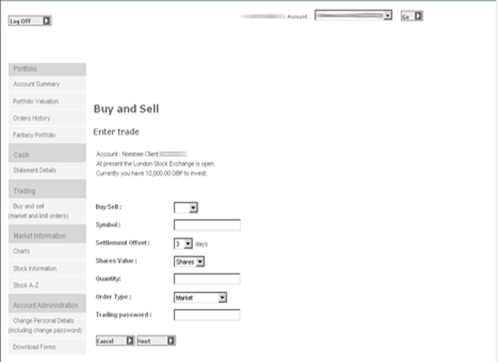 Add the symbol of the stock - this can be found using the Stock Information button on the left hand side of the screen. Choose which settlement period you want - this can be from 3 days to 20 days. Decide if you are trading a quantity of shares or a monetary value and then enter the quantity of shares or value of money you want to trade. Finally, enter your numerical 4 digit 'Trading password' and click on the 'Next' button. A price will be displayed together with a breakdown of the charges. You will then have 15 seconds to decide whether you want to accept the price or not. If you want to go ahead and execute the deal, simply press the Accept button and the order will be executed. Your account will be updated automatically and a contract note will be emailed to you. 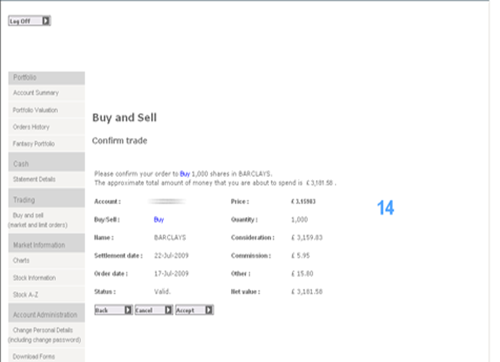 In the example below, the customer is looking to buy 1000 Barclays shares. All the relevant order details have been filled in and a quote has been requested. You can see that the charges have been itemised and there are 14 seconds still remaining in which to accept the quoted price of £3.15983. If the customer wanted to proceed and buy the shares, they would simply press the 'Accept' button at the bottom of the screen. You can only close a purchase order that has not yet reached its settlement date. By clicking on the 'Orders History' button of the left hand side of the screen, a list of all your previous trades will be displayed. 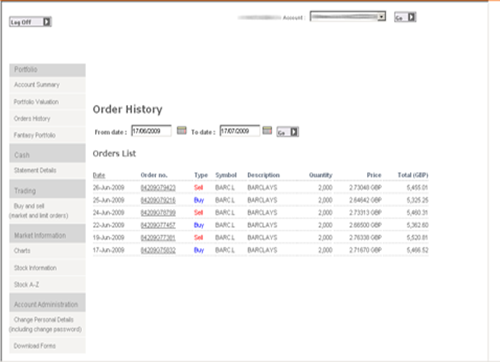 If you click on an 'order number' that appears against the trade that you wish to close the details of that particular bargain will be displayed. At the bottom of the screen you will see a button entitled 'Close this order.' Click on this and you will be taken to the dealing screen with all the details already populated, including the settlement date. How secure is it to trade online? As you would expect, all the information sent between you and our offices is encrypted, giving you total peace of mind. What stocks can I deal online? Most listed UK equities can be traded online though in a fast moving market the quantities that can be dealt may be restricted by the Market Makers. Some stocks simply cannot be traded online so you will need to call us to arrange these - the system will inform you of this at the time. Can I buy and sell share certificates online? No - you will need to transfer your certificates in to your share dealing account before you can sell them. Details of how to do this can be found in the How To Use section of the site.